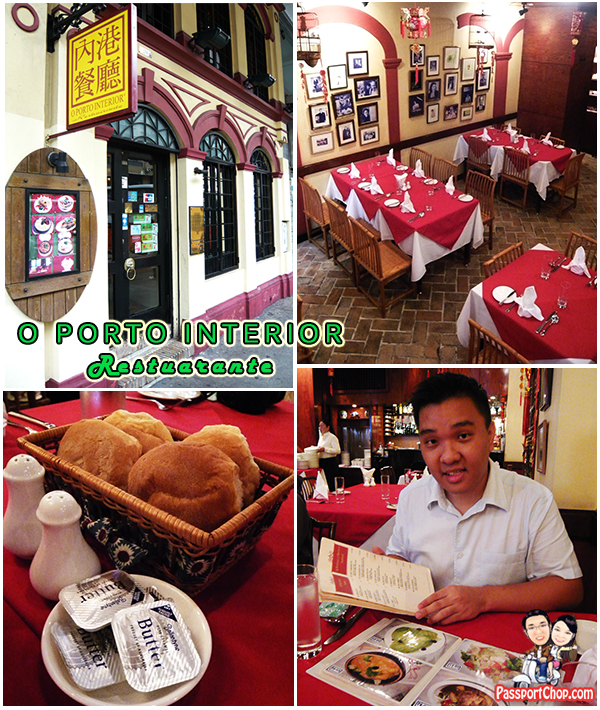 Located just a few minutes walk from the A-Ma temple, the O Porto Interior Restaurant is one of the best places to try Macanese and Portuguese Cuisine. The street along which O Porto Interior Restaurant is located – Rua do Almirante Sergio, also hosts a number of popular Portuguese restaurant e.g. A’ Lorcha. Look out for the bright yellow signboard indicating its location and its unique exterior design reflecting traditional Portuguese architecture and design. The restaurant interior also boasts a classy atmosphere with neat bright red table cloths and waiters and waitress in uniform. The menu is the best feature of this restaurant – very self-explanatory with pictures of every dish on offer. 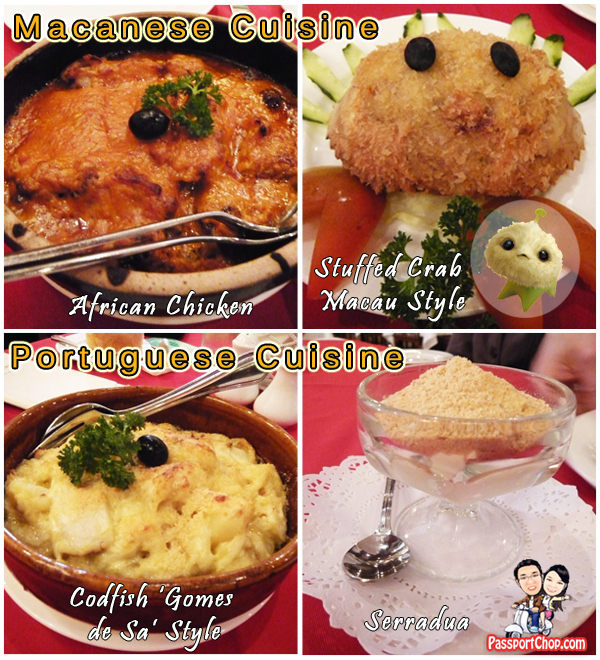 We tried a mixture of Macanese and Portuguese cuisine – Macanese being the African Chicken (1/2) at 90 MOP and the appetiser – Stuffed Crab Macau Style at 68 MOP (this dish looked like the CJ7 figure). The African Chicken tasted like curry chicken and the presentation of the Stuffed Crab Macau Style is actually floss over the crab shell which is stuffed with chicken meat fillings. For Portuguese food – the Codfish ‘Gomes de Su’ Style (128 MOP) has quite a unique style of cooking – it tasted sour and sweet at the same time and the best way to round off a Portuguese meal is with Serradura – a form of soft ice-cream (which isn’t cold) served with fine crushed biscuit – so you have the creamy and crispy taste. 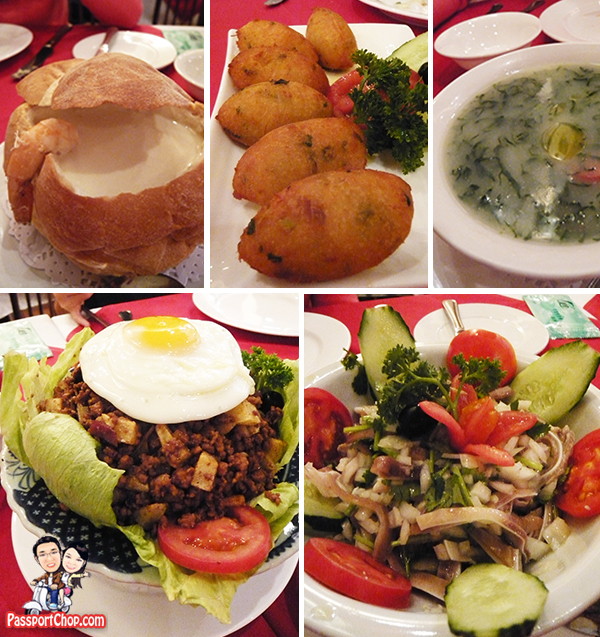 The restaurant also offers a number of unique dishes e.g. pig ear salad (MOP 55) at the bottom right of the picture below which has quite an interesting taste and a chewy feel too. For soup, you can sample the Tide of ‘O’ Porto Interior (MOP 45) which is essentially cream soup served in a bread bowl and also healthier Portuguese Green Soup (MOP 35). If you are not adventurous enough to try codfish (favorite ingredient of Portuguese cuisine) via the main course Codfish ‘Gomes de Su’ Style, you can also try the Delicious Codfish Cake (MOP 60) – i didn’t add the ‘delicious’; that’s what it is called in the menu and its sure does taste delicious. Besides the food, the service is first-class too. The waiters are patient and very helpful – each dish e.g. the CJ7 lookalike dish above is served in a nice presentation format with ample time for photo-trigger happy diners to take their photos before it is served in their ready-to-eat form. Wow! awesome post! I feel starving after I saw your photo’s. I like the interior very classic. I hope I can visit this place soon! Thanks for sharing this blog! I agree the interior looks really good. All those colours, especially the reds, look really good. I wish I have so much time and money. How do you find so much time and money to do all these trips?